Eng - Cannonau di Sardegna - Cantine di Orgosolo. In 2006, 17 small wine producers formed the Cantine di Orgosolo winery and selected the best Cannonau grapes from their vineyards in order to produce splendid and complex red wines. The harvest usually falls between the third week of September and the first week of October. The grapes are picked by hands and worked within few hours. We only use the best equipment, resulting in a delicate winemaking process for a product of the highest quality. Our wine region is characterized by small vineyards, infact each of our producers has an average of 1 hectar of vineyard: the total vineyard extension worked by our winery is 17 hectars. Our efforts are always aimed at preserving the oldest vineyards, some of them are so small that they still equires the use of the yoke of oxen for plowing. We choose to mantain our yeld at around 40-50 quintals per hectare (which is very low compared to 110 q.li per hectare permitted by the regulations of the D.O.C. Cannonau) to have wines of great character and personality. We are increasingly acquiring the organic certification for all our vineyards, some of them are going to be certified as biodynamic, too. The vineyards are set on rolling hills with shallow soils, mainly of granite origin, with good ventilation, which helps reduce pesticide treatments. The special orographic and climatic conditions and the traditional management of the vineyards make the biological choice quite easy to follow in this area. This sustainable philosophy is then reinforced in the cellar. The careful selection of the grapes follows a gentle process with the use of wild yeast and very low amounts of sulfites. The strong character of the wines and the wide spectrum of flavours and aromas are the result of our not-invasive manufacturing process and the wise location of the vineyards. 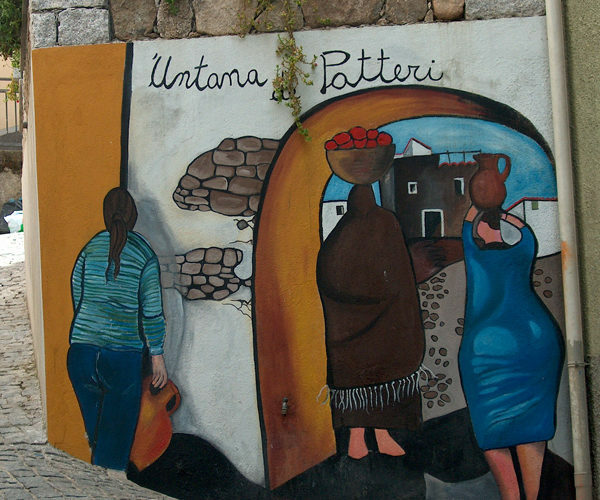 We are in Orgosolo, the “murals village”, located in the central and wild Sardinian subregion called Barbagia. Its communal land is one of the most extensive of Sardinia and is characterized by the Supramonte plateau: 50 square Km of uncontaminated territory, with one of the largest holm-oak forest in Europe: Sas Baddes. Downside from Orgosolo are located the Sorasi hills and the Locoe valley. These soils are perfect for vineyards and olive trees. These are lands of granitic origin, with an altitudo between 300-700 meters, protected to the east by the mountains of Supramonte and north by the Mount Ortobene. The vineyards are traditionally bush trained, which is still prevalent, even though, in the new installations, we are using the Guyot and the spurred cordon system. For plowing some of the old vineyards, we still use to the yoke of oxen. The Orgosolo’s silk production is certainly one of the highest expressions of our craftsmanship. This activity, that in the recent past was very common in our village, at present is done only by few families. The silk produced in Orgosolo is primarly aimed at creating “Su Lionzu” the elegant headdress which is one of the main part of the Orgosolo’s female typical costume. Nowdays there is only one artisan, Maria Corda, whom is able to perform the entire process which goes from the silkworms breeding to the silk weaving that is used to make the “Lionzu”. The “Lionzu” is constituted by a bandage of 1 meter and 1/2, 33 cm wide of silk. Its yellow color is made by using saffron. The Maria Corda’s laboratory, called “Tramas de seda” is always open to school groups and tourists. The silk thread that embellishes our Urulu and Soroi bottles is a product of this fine craftsmanship: a centuriesold tradition like the Cannonau cultivation. 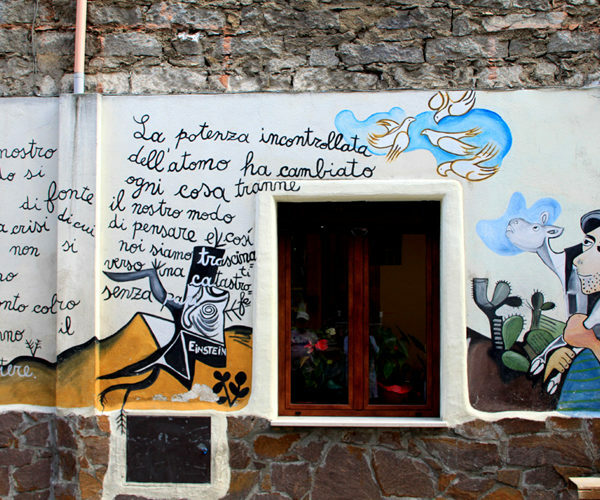 The first Orgosolo’s mural was done almost by chance, representing an unbalanced scales of justice, in the center of the village, in a wall behind the news-stand kiosk. 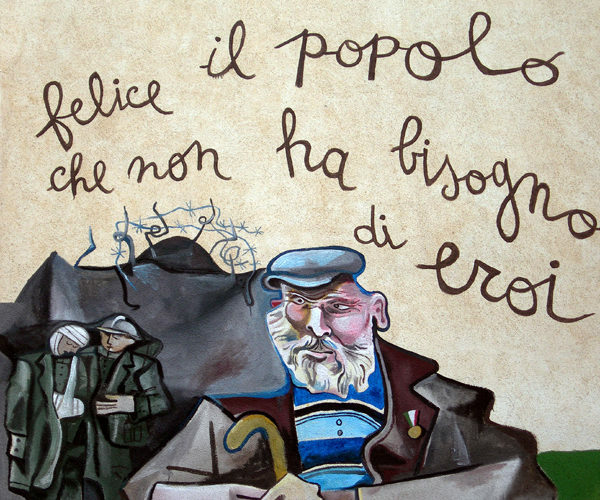 It was created by a group of anarchists from Milan, the “Dionysus Group”, which were in Sardinia during the student protest years at the end of the ’60s. 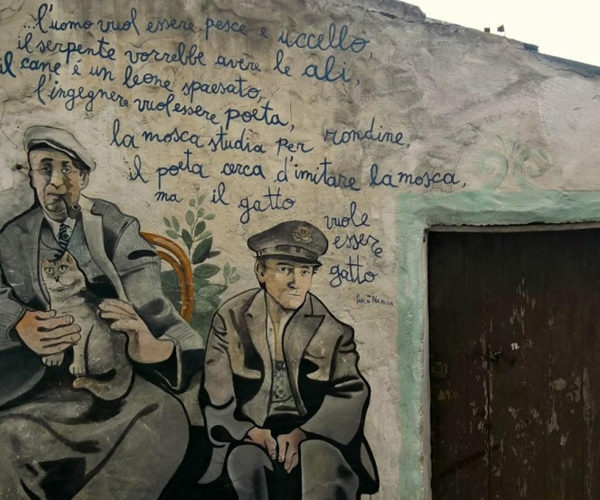 In the early 70s, thanks to a young art teacher from Siena named Francesco del Casino, the mural phenomenon become an organic part of the village life. Del Casino, helped by his pupils and imitated by other artists, transformed the gray Orgosolo’s houses in a colorful and incredible public art display. 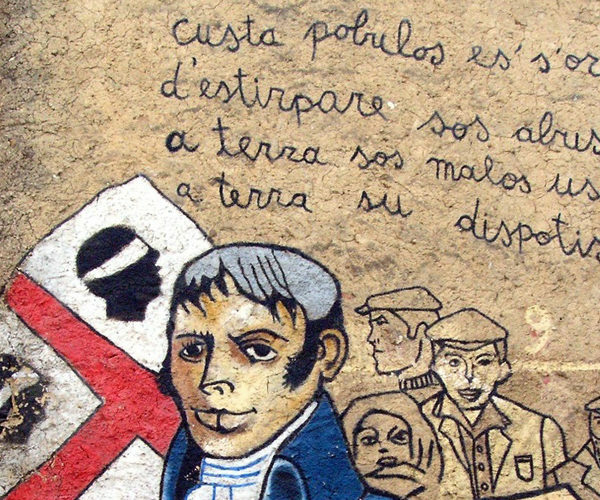 The murales themes were and are varied and diverse: social protests political, cultural, environmental, etc. They become like “a wall newspaper” which the people of Orgosolo love a lot and which are visited by thousand of tourists every year. The Supramonte is a vast plateau characterized, by the harsh and barren landscapes of the dolomitic limestone and the deep green of one of the last stretches of oak primeval forest of the whole Mediterranean region. The Supramonte is one of the most mysterious and fascinating place of the entire island, because it has been preserved intact, infact in its wild places live rare animals such as the mouflon, the wild boar, and the wild cat. The Supramonte is also home for birds such as the golden eagle, the goshawk, the peregrine falcon, the kestrel and the buzzard. The flora includes a large number of ancient oak trees, some of them are really remarkable for height and girth, and important examples of rare and endemic botanical species. store nearest you and come and enjoy the taste of Barbagia! Neale is vinified in stainless steel tanks for 6 months and then is matured in bottles for 3 months. The harvest is usually between the 3rd week of September and the 1st of October. The grapes are harvested by hand and worked in the winery within few hours. They are processed with a gentle treatment, aimed at obtaining high quality wines. The Neale blend is: Cannonau 85% and Muristellu 15% . According to recent studies done by leading researchers, the Muristellu variety is a Sardinian indigenous grape. It’s a fresh wine ready to drink, less structured than its big brother Urùlu, but retains all its great qualities. Locoe is a blend of Cannonau, Carignano, Bovale and Monica, it matures in oak barrels for 6 months, then in bottles for 3 months. The harvest is usually between the 3rd week of September and the 1st of October. The grapes are harvested by hand and worked in the winery within few hours. They are processed with a gentle treatment, aimed at obtaining high quality wines. Locoe is a full body red wine, very fruity, with hints of blackberries and plums. 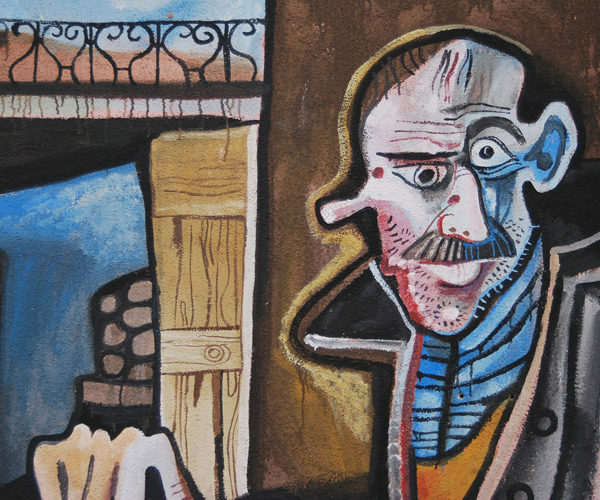 The palate is well structured, harmonious and persistent. It goes well with rosted red meat or stewed meat. It is also very nice with matured pecorino cheese. Locoe is for Orgosolo synonymous with “good land” to be dedicated to agriculture: vineyards, of course, but also olive trees and vegetables. Locoe was the name of a village that at the end of 1600 was abandoned and its inhabitants converged to Orgosolo and to Oliena. According to Dolores Turchi, scholar of Sardinian things, they were decimated by a terrible famine, which occurred in 1688. On the other hand, the “Historical Geographical Dictionary of the States of His Majesty the King of Sardinia” of Casalis, tells us that Locoe was abandoned in 1810. As a result, the Locoe’s communal land became possession of Orgosolo inhabitants. There is still a “divisional” paper, compiled just after the middle of the 19th century, for the realization of the plots of land to be assigned to the various Orgosolo families. Their efforts were abundantly rewarded by its mild climate and, above all, by the fertility of the site. Urulu matures in oak barrels for 9 months, then in bottles for 3 months. The time of harvest varies slightly depending on the season and still is between the 3rd week of September and the 1st of October. The harvest is usually between the 3rd week of September and the 1st of October. The grapes are harvested by hand and worked in the winery within few hours. They are processed with a gentle treatment, aimed at obtaining high quality wines. Urùlu is a prehistoric settlement where a Nuragic shrine was found. Located 4 km far from Orgosolo, at 800 meters above the sea level, it overlooks the Locoe Valley where vineyards were traditionally cultivated. In Urulu were found interesting and original nuragic artifacts (1900 years BC), including some ladles made in bronze, whose function, according to expert archaeologists, could be the same as the modern tastevin. Urùlu blend is 95% Cannonau and 5% a mix of Carignan, Monica di Sardegna, Pascale di Cagliari and Muristellu. In the right conditions it can be stored for al least 3 years allowing further refinement. Soroi is a cru Cannonau coming from a single high altitude vineyard located 700 meters above the sea level. The vineyard is bush trained and is 70 years old. This wine has a balanced symphony of aromas that reminds our harmonious “canto a tenore”. This shepherds’s polyphonic folk singing has been declared by the U.N.E.S.C.O. : “intangible heritage of humanity”. “Soroi” matures in oak barrels for 24 months, then in bottles for 3 months. The harvest is usually between the 3rd week of September and the 1st of October. The grapes are harvested by hand and worked in the winery within few hours. This is the first organic wine produced by our winery. Made with 100% Cannonau grapes that come from our low yeald vineyards located at around 500 meters above the sea level. It matures in chestnut oak barrels for six months. Luna Vona is a dry Cannonau, its fruity aromahas hints of black berries and its flavor is structured, harmonious and persistent. Our winery, in addition to producing superb Cannonau wines, has distilled an amazing and elegant brandy, Rosavalia, coming from our selected grape pomaces. After the operation of racking and selecting is concluded, the best pomace is delivered to a master craftsman who submits them to a distillation process according to a refined traditional technique. The result is a grappa with a clear color, intense and persistent aroma which refers to the complex aromas of the best Cannonau grapes. The taste is smooth, harmonious and complex.